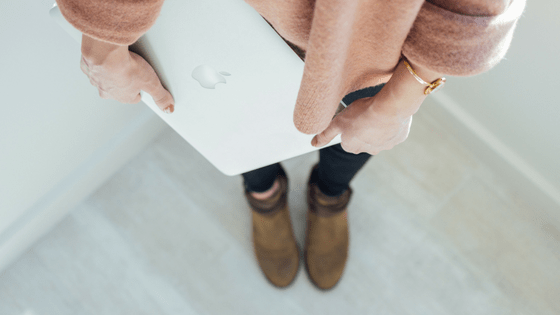 Are you using a free email course as part of your blog? If not, you should be! Free email courses are a great way to establish your expertise, give value to your readers, and pitch your paid product! 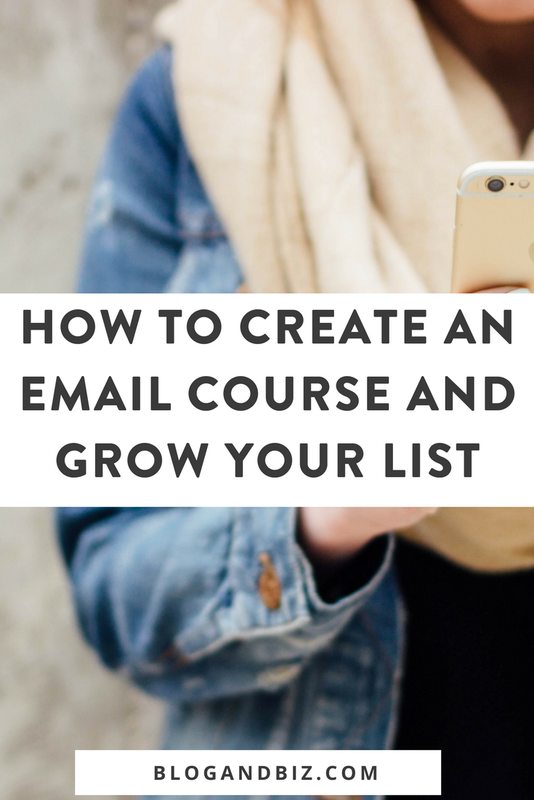 So let's talk about how to create a free email course and grow your list! *This post contains affiliate links. You can read my disclosure here. Email lists are great list builders. They give people a strong incentive to sign up and hand over their emails because they offer so much value. And they people that are signing up are the “right people” because they’re showing genuine interest in the topic of your paid product. Email lists prime your audience for your paid product. You don’t need to start from scratch when creating your course. Think about where you can draw content from. Create your content with the problem it's trying to solve in mind. You want it to be actionable so that people can really take steps to solve whatever their problem is (no matter how small). When picking a topic for your email course, you need to think about two things: (1) what is a particular problem your audience wants to solve and (2) what your endgame is. Are you trying to funnel people into one of your paid offerings? Your email list course should be like a first step towards the promise offered in your paid product. For example, my free course, Blog Boom Bootcamp offers beginner blogger tips, but if you want to go way more in depth, you’ll want my premium course, Break Into Blogging. Most email courses are 5-10 days in length. There’s no hard and fast rule, but 5-10 days is a good guideline. The content in your email course should be a mix of purely valuable educational content, and content that primes the reader for your paid product. After welcoming your reader and explaining what the course is going to do for them, your first few days should provide pure value. You should not spend the whole time pitching. Save the pitch for the last couple days, and even then, mix it in with valuable content. Your course needs to help people solve their problem. If it doesn’t do that, no one is going to want to buy your product because they won’t trust that you can solve their bigger problem. So focus on value about all else. The best way to get people to sign up is to create a landing page using a tool like Leadpages. Leadpages allows you to create highly customized, and high converting, landing page. I wrote a blog post about Leadpages here. Here’s an example of the landing page for my email course. Create a simple landing page with a short description of what people will get out of the course and you’re good to go. And wherever else you can! 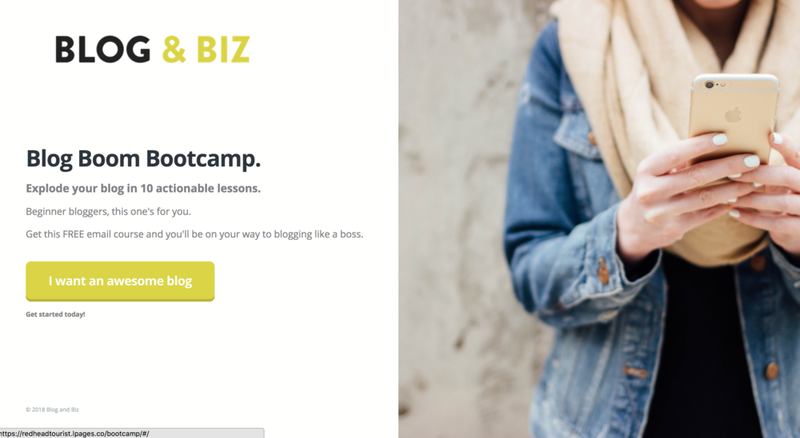 If you’re using ConvertKit, setting up your email course is easy. First, make a form for your course. (People will still sign up through Leadpages, but everything ultimately goes through that form). Once you have a form, set up a “sequence.” A sequence is simply a set of emails that go out at scheduled intervals. 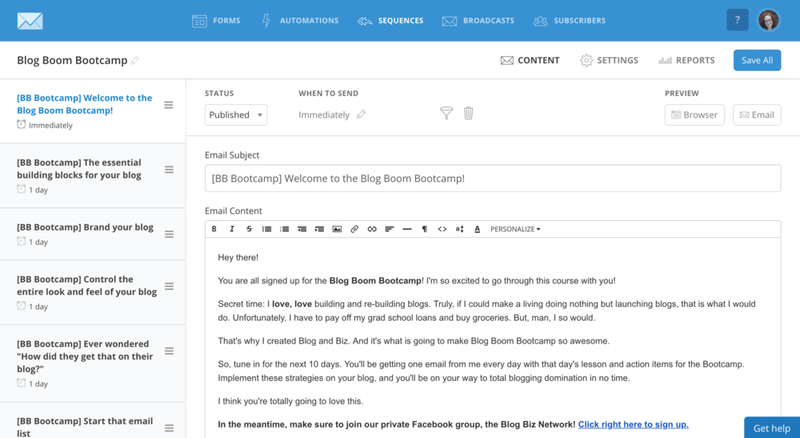 So for your email course, you might create one welcome email that goes out immediately upon signup, and then five content emails that go out every 24 hours for 5 days. Finally, go to the Automations tab, and set up a “rule” saying that every time someone signs up through your course form, they get subscribed to your course sequence. So, get to work creating that email course! It'll provide great value to your readers and give you a chance to talk about your paid product. Great advice in this article Becca! I’ve gone down the Email Course route myself and am having some decent luck with it. Another place to consider promoting your landing page for your email course is through paid ads. So far I’ve dabbled with Facebook, Pinterest and Google Ads. Surprisingly, Google Ads have been the least expensive, in terms of cost per lead. Anyway, just though I’d share that. Interesting about the Google ads. I’ve never tried them. Glad you enjoyed the article!